Thanks! Oh, and thank you for the Tiny328 ? +1 this is genius !! Is it possible to buy this kind of stuff ?? Thanks! Not yet but I am about to look into it. In that case you would need a voltage regulator. 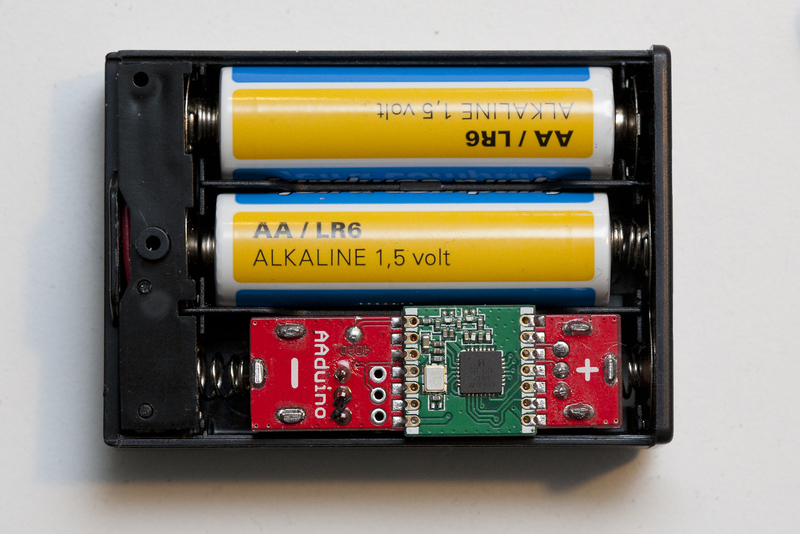 The AAduino is designed to run from unregulated batteries and the RFM69 does not support 3.7V IIRC. OTOH you could get ~3yrs uptime with good AA batteries according to Nathan Chantrell. Aha, thanks for pointing that out. Brilliant, man! Just a superb idea! Really cool project (and above my skill level, that’s for sure!). 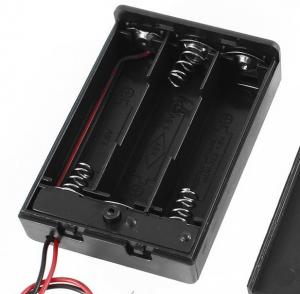 As far as worrying about when your batteries run really low, have you considered adding a joule thief / battery vampire to your setup? Thanks! Joule thiefs are above my skill level but seem like an interesting addition. Replace the LED in the joule thief design with a simple diode and put an electrolytic capacitor (I’ve used 100uF with no problems) across + and – (after the diode) to get stable power. Well that’s an interesting thought. Must look into that. Thanks! I’m down to back a kickstarter or indigogo. I agree, get this thing on kickstarter! me too(tm). I’d love to build this, but I don’t want to scrounge for all the parts. Also, I’d love to help organize the Kickstarter with you. I can handle “north american distribution” or whatever else you’d like. I will see what I can do to make the AAduino available for purchase. That’s correct. I use 8MHz which is still somewhat out of spec at lower levels but a lot better than 16MHz. Having this thing working with regular AAs is of course very nice, and as I understand it, it does already. But if the voltage-drop of regular Alkalines becomes a problem, there is the Energizer L91. Then you get operation down to -40degC as well. Set CLKDIV8 fuse and you’ll be on a safe side with both 8 MHz (1 MHz CLK) and 16 MHz (2 MHz CLK). Brilliant! I’d buy 10! If you launch a Kickstarter, you already have my pledge! This has everything and more that I need for most of my projects. It’s no wonder I see you article everywhere! I am not clear on how this is powered by the two batteries it is in series with. do you short the two leads to complete the circuit? That’s right. 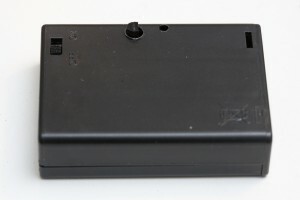 The leads sticking out of the battery holder are cut and shorted. I think you might be a genius.. thats so simple. Congratulation man, that´s really a great idea. I have a couple of ideas that may require “some” validation. Is there any way to be in touch with you directly? Direct email or Twitter account will be great. Thanks! Check my GitHub page for contact info. This is a great idea, and reducing it all down to the size of an AA makes it so much more practical for size-limited tasks. 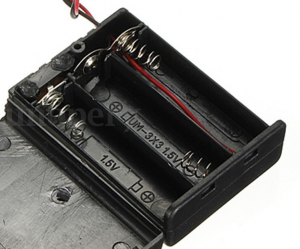 Have you considered the 18650 form factor lithium battery? If the board were that size then you would be able to use it in a 2-cell box with a higher available voltage. That idea crossed my mind also. Also makes it possible to add an NRF24L01+ with a widht of 17mm, and running the AVR on 3,3v thus 8mhz. Oh goodness, the 18650 idea would be fabulous, especially because a single 18650 would be able to put out an excellent amount of power for a single cell. Think if the board was designed to hold a single 18650 (as well as expose a Li-Ion charger / regulator). That would be quite useful for deploying remote sensors. I am also looking forward to a kickstarter/indiegogo thing. I am sure a version to go along with a single 18650 will have uses. 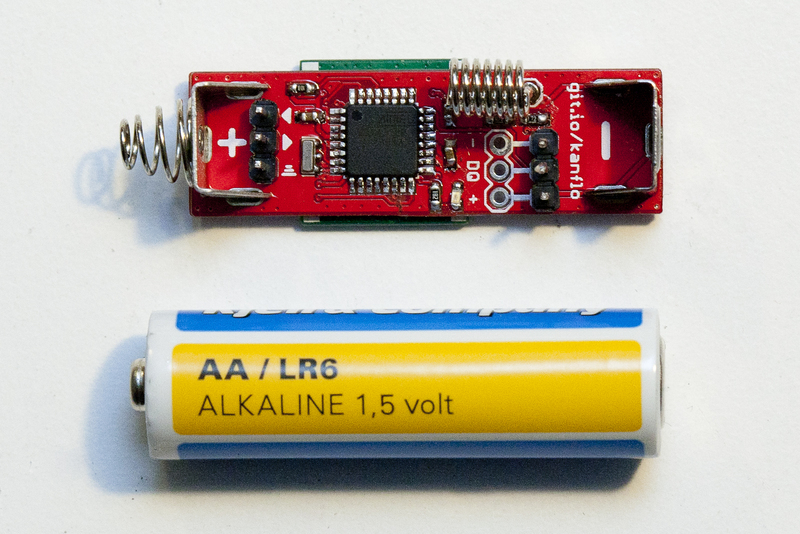 But given the self-discharge rates of Li-ion (8%/month @21degC) vs Akaline (2-3%/year), a pair of good AAs will quite possibly result in longer uninterrupted runtime for a low-power remote sensor. Also, a charger circuit will add to the cost. Not a function *most* users will utilize very often, I presume. A joule thief sounds intriguing. But from my understanding of it, it has an oscillator, and hence it also *consumes* power. Not sure if the effect of a JT or any other voltage booster will result in actual longer runtime for the typical usecase. Can it be designed to only be in effect when the battery voltage sags below some threshold? I am not an electronics guy, so I have no clue. But there is no free lunch. Somebody do the math, please. I am curious about how much a prebuilt AAduino may cost…. Good point regarding Li-Ion discharge rates… I think I might just want an excuse to use all of the 18650s I’ve harvested from old laptop batteries, so maybe I’m biased. Lots of excellent ideas rolling around here in this thread. Hopefully we will see some of them come to fruition. The AAduino could very well run on a CR123. It would not last as long as on 2xAAs but would make an even tinier node. But, as I’m color-blind, rather a SW techie and have few experience with soldering: when and where can I buy it? Also, how can I receive and work with the data on Raspberry Pi? You would need some kind of gateway to receive the data on the 868MHz radio and feed it to the Pi that in turn posts the data to some kind of web service. There are some available radio gateways available. The Emoncms project have one called RFM12Pi that aka believe you can buy online. I build a similar one called BranlyPi for the purpose of learning PCB CAD and SMT mounting. As for the AAduino, I will look into the possibility of making it available for purchasing. I assume it is compatible with Flutter, but I haven’t looked into protocol support. Very cool, AND with an ISM transceiver? Even cooler. I have begun tweeting! I’m a Product Manager and technology marketer. A colleague at the large company we work at introduced me to your site. Keep up the awesome creative work! 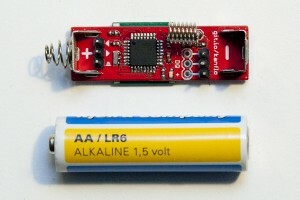 what about using a 3.6V LiPo Cell in AA size? Do you think the PCB board of a soil Hygrometer Detection Module would fit in the box? I have one of those and the PCB is too wide. Perhaps with a box for 5x AA if it exists. I just came across this. Might be an interesting addition if you wanted to remotely turn a project on and off. Could probably automate to some extent, too. I also think you should kickstart/indiegogo it. Any idea about the cost? Is there a option that your hardware is going to work with mysensors? What is the battery life of this sensor? I plan to look into mysensors. The battery life should be around 3yrs with good batteries. OSH is probably a great place to get boards done. Anyone have a suggestion for BOM? I second this! I’d love to see this as a shared project on OSH Park so we can order the PCB’s. Combined with an 0.91″ OLED (128x32px, panel size 30×11.5 mm) would be the cherry on the top. Power consumption should be quite low: max 12/18mA with 50/100% pixels lit , sleep mode 2uA. The 15pin FPC connector has the same with (13.15mm) as your PCB. Hi Dag. I actually began looking into this yesterday. Stay tuned. What gateway do you use to have all of your sensors communicate back to a local base station? I’ve been deploying some ESP8266 based wireless temperature sensors, but these are significantly more efficient…. I currently use my BranlyPi to receive data and a Python script to post it to Emoncms. I have not tried rechargeable batteries, I don’t know how they would match up to their non rechargeable counterparts. Looking for the Kickstarter project! any news about a possible Kickstarter/Indiegogo campaign? Thanks for taking interest. I am in discussion about this and should have something to announce soon. No news yet, my time is currently a bit restrained I’m afraid. I use a single LiFePO4 with the ESP8266 programmed under Arduino. This fits into a 2-AA holder. Cool! What running time do you get? I have had the ESP8266+0.96OLED display running for as long as 4 hours and still going strong; but I have never attempted to record the full life-span of the LiFePO4 cell … my specific need for this device is that it was built as a open WiFi “war walker” … walking around my neighborhood … most of my walks are under 60 minutes. If you have not looked into LiFePO4 cells, they are simply great for hobby work. The chemistry never permits any elementary lithium production, so fire risks are low to non-existent. I was really impressed by this design, what with it being so small. However my concern is that ds18b20 sensors do not work below 3v. 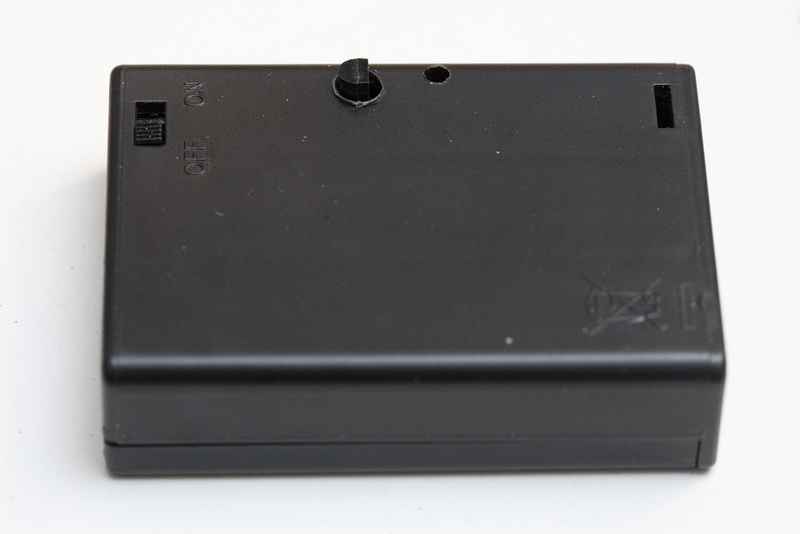 What is your plan for when your batteries start to go flat ? something tells me the battery life here that this can actually operate at is not very long because while the microcontroller will run well down to 1.8v, the sensors will not function properly below 3v, which kind of defeats the point. That is indeed a very good point I need to consider. Others seem to have had success with the ’20 below 3V. I’ll look into that one. 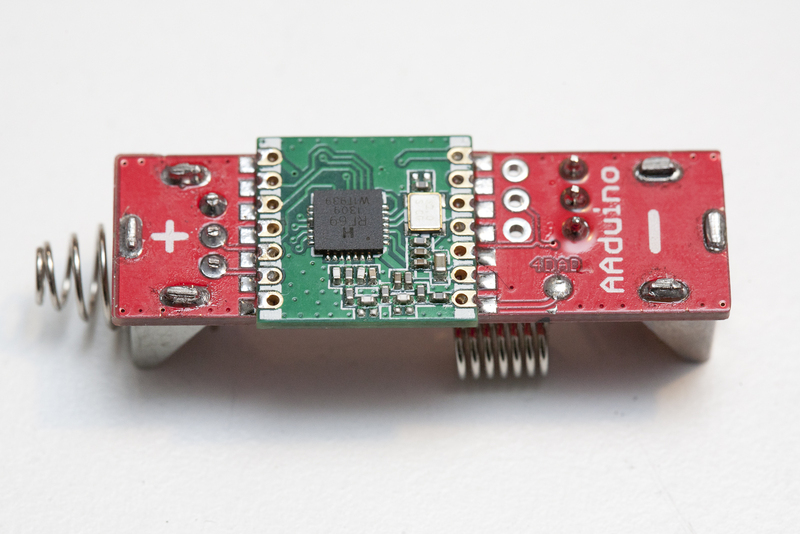 Where can I buy the AAduino ? Nowhere yet but the plan is to fix that. This is an excellent idea! I’ve been working on a small FM radio for years to hear 72-76MHz transmissions, and one thing that’s kept me from making a bunch of them is the form factor. With this, I can stick the radio in the box and just drill a hole for the headphone jack and I’m in business! My design can fit on a 14.5x50mm board, so that should be just fine. Thanks for sharing! Thanks! Would love to see your design. Add my name to the list of folks interested in buying these when available. If you are pressed to put time into the development of these devices, let me suggest talking with the LowPowerLab people. They have solid experience putting together many small, similar boards. Thanks Stewart! I have one option I will explore this summer and will definitely check with LowPowerLab if that option does not work out. Put me down for a few of these. WOW!!!! Wish I could buy them now. Johan, I see you have updated the article to point at DirtyPCBs boards for the AAduino. (Not sure when that happened.) Thank you for that. I am still hoping for a prebuilt device. Pretty sure I am not alone in that regard. From the Commadorable 64 comments, it appears you are still working out the details for prebuilt AAduinos. Is that correct? Hi Dag. That happened a few days ago and yes, there is (low bandwidth) work ongoing for crowd funding the AAduino. I found this amazing project and I want to buy. One question: if I buy from DirtyPCBs AAduino I’ll receive AAduino mounted and ready for use? what frequency version of the RFM69C have you used? Hi Louis. I have used the 868MHz version. And about the antenna, could you give me its characteristics, like total length of the wire, diameter of the spires, and tickness of the wire? I am afraid I cannot. When not using a piece of wire cut to the right length I use scrap antennas from discarded 868MHz devices and have still to find a source of these. Hello Johan, is this Packet radio you are doing, or LoRa? Sorry for my stupid question, you are using RFM69, not RFM9x. Hence Packet radio. Looking at the pinout of the ’95W I see it’s not compatible with the ’69CW footprint. I have not dived into LoRa yet but will do a LoRa version when the day comes. Do you use a special programming adapter in order to burn the bootloader and sketch to the ATmega328? I used a TQFP32-DIP32 adapter from eBay to build a “breadboard Arduino” and flashed the boot loader onto the chips prior to mounting. From there I used the UART pins in the AAduino to flash the application. I am just working on an AAduino with iCSP and FTDI-Adapter. onboard. This way I can solder an “empty” ATmega328 on the PCB. After soldering flashing bootloader and sketch to the atmega is pretty easy. Could we use SPI to program it (without bootloader) as the chip is soldered onto the aaduino PCB? That should work. @Thomas has more experience than me with this. yes, just connect the SPI-Pins and Reset to a 2×3 Pin Male Header. Then you have an ICSP Interface. Now you can connect an AVR Programming Adapter to the AAduino and flash the ATmega328. An ICSP Connector would be a very useful enhancement for a future AAduino PCB Version. do i need the oscillator to program the microcontroler by icsp ? I would think so but have never tried without it. Basically you can flash an Arduino Board with ATmega328 over ICSP with no external oscillator. You only need to choose an 8MHz Board in your Arduino IDE. By default 8MHz Arduino is not included in the IDE. 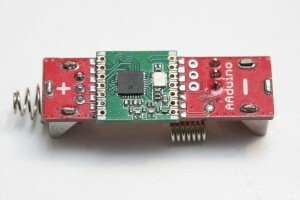 For low power applications an 8MHz Arduino (with internal oscillator) is an ideal solution. Oh, that reminds me. My first Arduino design ran on the internal oscillator. It screwed up the UART baud rate slightly so TX failed. 115200 baud ended up around 117000 IIRC. I added the external oscillator and all was well.